If you're time constrained on your next visit to Boston, the the Freedom Trail is THE way to see what makes Boston special and a staple for any Boston bound travelers. It's the best way to start off your Boston experience. From the Park Street T station head to the Visitor Center to pick up your map and follow the red brick road back in time. 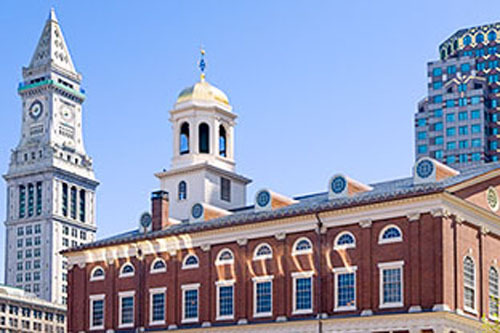 Explore Ben Franklin's shop to Faneuil Hall (think Lincoln Douglas Debates), wander through the North End to Paul Revere’s house and the Old North Church. This is the Italian section so revive your self with a treat from Mikes Pastry or Café Vittoria on Hanover Street. The Freedom Trail ends at the USS Constitution (aka Old Ironside) just under the shadow of Breeds Hill and the Bunker Hill Monument. Head back to Park Street and wander west through the Boston Common where it is still legal to graze your cow. 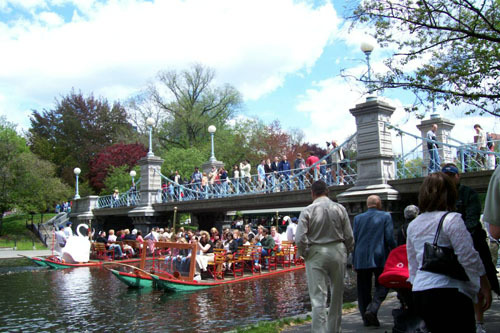 Cross Charles Street into Boston Public Garden for a ride on a Swan Boat. If you are a children’s literature fan, drop by the statue of the duck family from Robert McCloskey’s timeless classic Make Way for Ducklings. 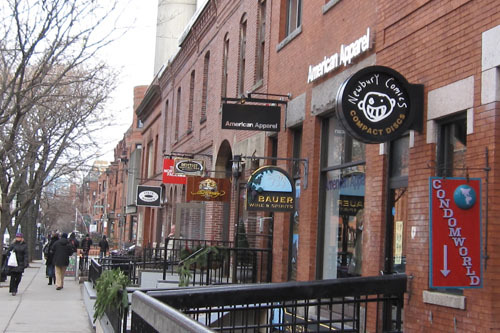 On the far side of the Boston Garden is the beginning of Newbury Street, a high end shopper’s paradise. Head up Newbury and take a left on Dartmouth Street to Copley Square where HH Richardson’s Trinity Church (1872) can be seen reflected in the glass of I.M. Pei’s Hancock Tower (1972). Just across the street is the US’s first public library – which houses US President’s John Adam’s complete library of books and is on public display. From the protests of Samuel Adams and James Otis, to the Boston Massacre and the Boston Tea Party, to the liberation of Boston in 1776 by General Washington and his army, the Heart of The Freedom Trail takes you to the sites and tells the stories that led to American independence. 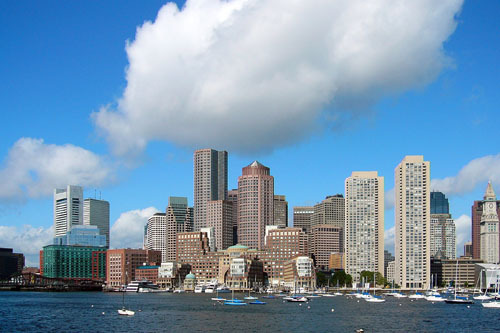 Boston By Little Feet, offered on weekends, is a shorter version of this tour aimed at children 6-12 years. “One if by land, two if by sea” are words attributed to Paul Revere, the “Midnight Messenger” of the Revolutionary War, who devised the plan to hang two lanterns to signal that the British troops were coming by sea. 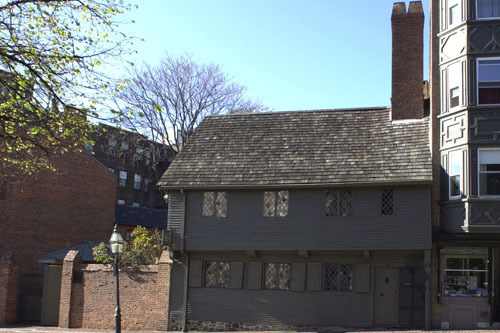 His colonial-era home is the oldest building in downtown Boston and in impeccable condition. A silversmith by trade, Revere owned this home from 1770 to 1800. In 1908, after Revere’s great-grandson purchased the house, he opened its doors to the public as one of the earliest historic house museums. A 900-pound bell made by Paul Revere and antiques from this era add to its interest. Check the Website for special exhibits, events and lectures offered throughout the year. Nestled in the North End district, now known for its Italian cuisine, follow a visit to this home with espresso and pastries in one of the many Italian cafes. Metro: Government Station then 15 min walk. Closed on Mondays January through March. Located near the Boston Common, the stage for many historical events, the public gardens are a sanctuary from city life and America’s first public botanical garden. Bostonians often come to see what’s in bloom or to take a ride on one of the swan boats – pedal boats, owned by the oldest family-run business in the country. The garden links up with the Boston Common, and together these two parks form the north terminus of the Emerald Necklace, a long string of parks designed by Fredrick Law Olmstead. The park is very well kept, as the city maintains the formal plantings from season to season. There are a few famous sculptures here, such as an equestrian statue of George Washington and a set of bronze statuettes from the popular children’s book, Make Way for Ducklings. Look for them between the pond and the Charles Street and Beacon Street entrances. 40 minutes from the airport on the T.
One of the first streets created on the Back Bay marshland, Newbury Street is known for its historical sites as well as its world-class retail shops. Sightseers can visit the Gibson House museum, home of one of Back Bay’s first private residences, or the Emmanuel Church, which was the first building erected on the street. The shopping district is home to boutiques that carry the world’s biggest brand names. Bars and restaurants proliferate in this neighborhood, ranging from quirky ice cream shops to hookah bars to five-star restaurants. Spring, Summer and Fall are the best times to stroll along the tree-lined sidewalks, but even during a blustery Winter it has its bonuses. A hot cup of cocoa just gets better in cold weather. Find it in one of the many, not-so-commercial cafes - a perfect end to a long afternoon of shopping. Metro: Copley Square or Hynes Convention Center. 20 mins from the airport: Take the shuttle bus to the Blue Line Airport Station then the subway ("T") to Copley Square. 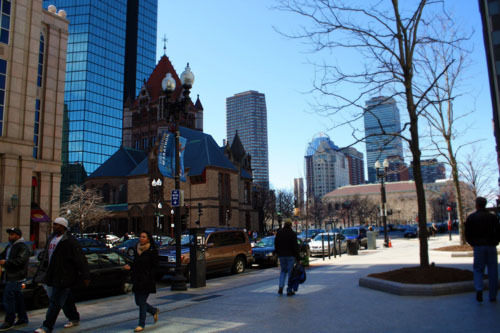 The main square of the Back Bay area, Copley Square is surrounded by old and modern buildings including department stores, hotels and even churches.The square was created in 1858 when the Back Bay Fens was filled in. Trinity Church, designed in 1877 by architect H.H. Richardson, is located on the eastern side of the square. This Romanesque-style beauty was considered his tour de force and lifetime masterpiece. The Boston Public Library, a celebrated Renaissance-style building, is located on the western side of the square. Its beautiful marble interior, large sculptures, and regal staircases are worthy of more than just a peek. The square is adjacent to the finish line of the Boston Marathon, which takes place in the spring, and a bronze sculpture was instilled to commemorate the annual event. The Square is a nice place to catch some rays and a good view, and appreciate some of Boston’s best-known architecture. Grab a bite to eat or indulge in some retail therapy at the Copley Place shops. Take the subway to Copley Square. 20 mins from the airport: Take the shuttle bus to the Blue Line Airport Station then the subway ("T") to Copley Square. Guided tours offered daily. Check website for specific times. Self-guided tours are also available during designated times. All tours, self-guided or guided, include a copy of Trinity's award-winning map.